Made a change to remove the feature in which holding a modifier key (such as Shift or Option) down while choosing an item from the Scripts or Filters or Clippings menu would perform alternative operations (such as Reveal in Finder or Edit). The "Edit..." button in the toolbar for folder-backed palettes (Scripts, Filters, Clippings) has received an ellipsisectomy. Updated the wording of the title bar violator (which appears unless you have entered a valid license code) so that it's clearer that you can keep using BBEdit after the evaluation period is over. The violator now specifies "Free Mode" instead of "Evaluation Ended". Fixed a latent bug in the list of search sources used in the Multi-File Search window. Restored "Quick Look" in disk browsers and project windows to working order. In cases where a progress window needs to be interrupted for a modal alert (usually when connecting via sftp), switch off window animations and delay the return of the progress bar for a smoother experience. Fixed a bug in which file locators provided by external "open file" requests were not "standardized", which could lead to situations in which locators which indicated the same item via different paths were not treated as equivalent; and fixed the case in the bbedittool which triggered the initial report. Made a change so that certain irrelevant errors returned when running an AppleScriptObjC script are no longer reported. Fixed crash which would occur when trying to store information about a recently used item in situations where the item had been deleted. Fixed a thread-safety issue which could cause a crash during multi-file search in situations where it was necessary to parse an HTML or XML file to guess its character set. Fixed bug in which the Objective-C guesser was a little bit too liberal, and would be tricked by @classmethod in Python text. Fixed various bugs in the "Compare Revisions" and "Compare Arbitrary Revisions" dialogs, including a crash which would occur when an item in a revision list was double-clicked, which would in turn attempt a comparison even when no other revision was selected. Fixed a case in which the Objective-C[++] function scanner would run off the end of the text in certain rare situations. Fixed case in which the function menu item in the navigation bar was allowed to be arbitrarily large, which would cause it to push items on the left-hand side (such as Text Options and the file path) out of view. Fixed crash which would occur when using "Reveal in Project List" and the operation required automatically twisting open a folder ancestor of the file being revealed. Fixed bug in which a project document closed with a hidden sidebar would reopen with the sidebar visible. While entering a path in the Find Differences window for a file or directory that does not exist, trailing slashes would occasionally need to be typed twice. Once should now suffice. Fixed a bug in which tracking a close widget in the sidebar would leave the widget in a "hover" state in the case that the mouse was dragged and released outside of the bounds of the sidebar. Fixed bug in which calculations done during line-ending conversion ended up with incorrect answers in files with inconsistent line breaks. Fixed bug in which object-class-specific attachment scripts (e.g. Document.scpt) were not being run when they should have. Fixed a case in which the application would crash when cancelling an SFTP connection in progress. Made changes to prevent a class of crashes that would occur on macOS 10.12 in cases where a password request or host key confirmation was canceled while connecting to an SFTP server. Fixed a crash which would occur when a saved set of multi-file search items contained a reference to itself, or when two (or more) saved sets created a reference loop. Fixed bug in which "Select All" was enabled on the Edit menu in situations where it shouldn't have been, and using it (or pressing Cmd-A) would trigger an internal exception. Fixed a bug in which more work than necessary was being done while building the item tree for folders in projects (insta- or otherwise). Fixed bug in which instaprojects would not open up with the correct sidebar width, which was particularly noticeable when the width had been customized via "Save Default Project Window". Fixed a bug in which Hard Wrap would leave the last line of a paragraph unbroken in cases where it was longer than the wrap width. Made a change to reduce the CPU required during mouse tracking (such as when making text selections). Updated some built-in links to our web site to use https. Fixed bug in which applying a text factory from the "Apply Text Filter" submenu did nothing (which was the best outcome, given what could have happened). Fixed bug in which in-process input using some input sources was highlighted using the yellow highlight when the text should have been underlined. When text should be highlighted using the yellow highlight, the background color is now used when a dark color scheme is in effect, to correct readability problems. Fixed bug in which certain sequences of scripted open document/close document operations would behave inconsistently when there was too little time elapsed between the open and close (or between a close and subsequent open). Fixed a bug in which aliases (or symlinks) to folders were not sorted by name with other folders when "sort folders first" is in effect. Made a change to improve compatibility with future macOS releases. Next story Snippetty 1.0 – An application that loads code snippets file reduction. Previous story Solis 1.0 – A Live Design Output that integrates seamlessly with your favourite code editor. 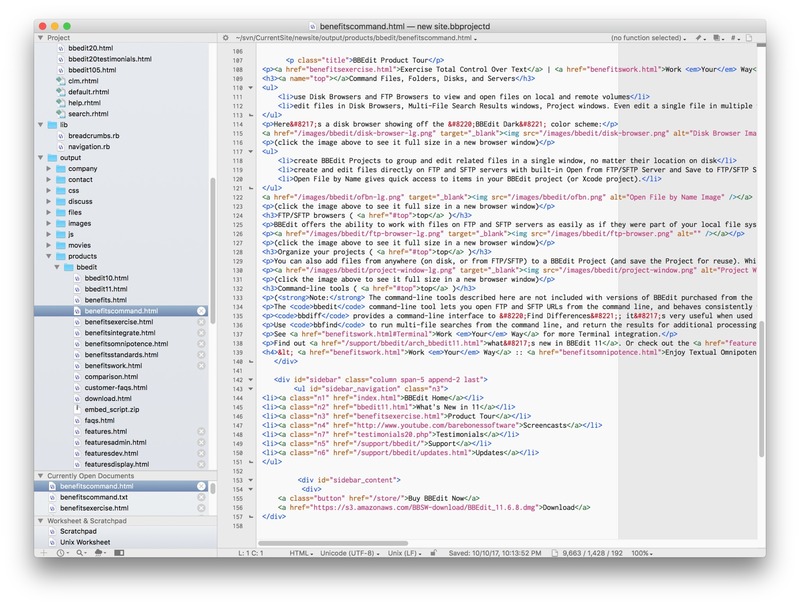 Sublime Text 3141 – Sophisticated text editor for code, markup, and prose (beta).